Every version of SQL Server comes with a lot of optimizations to the database engine, and these changes require changes to the T-SQL syntax. New statements are introduced or modified and existing ones are dropped. Often table and query hints are optimized and modified in a similar fashion. These table and query hints are often used (in many cases, indiscriminately) to “improve the performance” of Microsoft SQL Server. Let me start outright by saying that till date, I have never encountered the need to use the hint that we are about to discuss today. --Query for demonstration purposes only! The WITH (NOLOCK) hint is applied to the table/CTE/sub-query, i.e. a data source. Hence the name – table hint. The OPTION (MAXDOP 1) is applied to the entire query, and hence the name – query hint. “FASTFIRSTROW” is not a recognized table hints option. If it is intended as a parameter to a table-valued function or to the CHANGETABLE function, ensure that your database compatibility mode is set to 90. The message says it all – FASTFIRSTROW is no longer available, and if you would like to use it, the database compatibility level needs to be set to 90 (i.e. 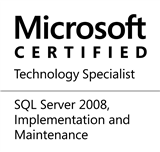 SQL Server 2005). The replacement available is not a table hint, but a new query hint – FAST number_rows. This query hint specifies that the query is optimized for fast retrieval of the first number_rows. This is a nonnegative integer. After the first number_rows are returned, the query continues execution and produces its full result set. SQL Server 2012 has given more flexibility to the developer/administrator because the table hint only optimized for the first row, whereas the query hint allows you to specify a custom number of first rows to optimize for. As a replacement of FASTFIRSTROW, you can use OPTION (FAST 1). This entry was posted in #SQLServer, Blog, Imported from BeyondRelational and tagged #SQLServer on May 24, 2012 by nakulvachhrajani.